A few years ago, my wife (a member of the Bury St Edmunds Guild of Weavers, Spinners and Dyers) expressed a wish to purchase a wool picker as a means of speeding up the preparation of fleeces prior to drum carding. Looking into what devices were on sale, I soon realised that wool pickers were not cheap machines to buy, but also noted that there were a lot of internet sites showing versions that had been made by home constructors. From reading about these do-it-yourself machines, it quickly became apparent that there was more of an art than science about achieving a workable device, with everybody going about their design in slightly different ways. Being a relative novice as regards fleece preparation, I had to try to sort out the general requirements used in nearly all the available versions from the more qwirky ideas that others had, before considering myself sufficiently knowledgeable to be able to set about building a wool picker myself. As a now-retired mechanical design engineer, familiar with various top-end solid modelling CAD packages, I had carried on with this method of design for my many subsequent home projects, albeit using the much less sophisticated (but free) SketchUp Make computer program. This allowed me to try out several different approaches before settling on one and starting to cut wood with the confidence that much of the guesswork had been eliminated. Using SketchUp for the design stage has also allowed me to produce exploded views of the various parts of the project which I hope will give you a better understanding of my construction method, in the hope that you may want to replicate it for yourself. The majority of wool picker designs that I analysed had simple lift-off top slide units which ran wood-on-wood, whilst a few had captivated slides, running in slots on each side of the base. I decided to improve on this latter method by incorporating plastic ball bearings in the slide, to reduce the operating effort. Probably for simplicity, several designs had the nails directly fitted to the base and slide plate, giving no means of adjusting the nail separation/overlap. I chose to have separate interchangeable nailplates, with the baseplate pair adjustable over a wide range. Each section includes an exploded drawing, with individual parts coloured separately for ease of identification, together with a parts list and, where appropriate, purchase details. The first, and greatest, constraint I had was that of material choice as, due to the end usage the machine would be put to, it would not have been sensible to use any form of soft-wood that would have been unable to handle the forces involved in 'combing' the fleece. Fortunately, I had a small supply of maple tongue and groove boarding that a neighbour had removed from his floor and given to me for burning on my fire. This boarding was 18 mm thick and in lengths of around 750 mm and, when the tongue and groove were removed, ended with a width of approx 115 mm. Four full-length boards were used for the construction of the Base Frame, the two horizontal pieces of which required no special machining. Each of the side pieces, though, needed a lengthwise slot cut on their respective outer faces (to suit the ball bearings used in the Slide Unit), a cross slot on the inside face at each end (to suit the plastic end blanking plates) and four short slots (for the height adjustment screws). 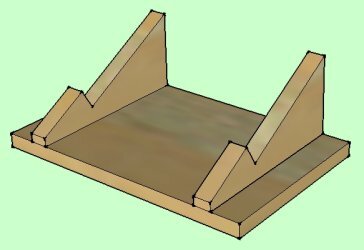 The three base feet were made from offcuts of the same maple boarding, with dimensions of 340 x 70 mm, and screwed to the base boards to hold the two horizontal boards together, with six rubber pads fitted, to give a non-slip surface. The plastic end blanking plates were cut from 6 mm perspex sheet and measure 240 x 97 mm, with two 25 mm dia holes drilled in each to assist their fitting and removal. The horizontal platform of the Slide Unit was formed by butting two 115 mm wide boards of length 270 mm together. The two vertical side pieces, also made from 115 mm wide boards, were cut to a length of 230 mm with the corners rounded off as shown. The two handles were made from 30 mm dia dowelling, cut to 270 mm long. A total of ten plastic ball bearings, five fitted to each of the side plates, were of 5 x 19 x 6 mm dimensions and incorporated slightly offset inner races, which allowed them to be solidly clamped without binding their respective outer races. In order that the longitudinal grooves in the base plate, that guided the bearings, did not have to be unnecessarily deep, the M5 screws that hold the bearings had to have the height of their hexagonal heads reduced to around 1 mm. Initially, the lower, adjustable nail plate set only consisted of the two-seperate nail plates plus a hinged ramp plate, fitted at each end, to provide a smooth inlet and exit for the fleece. The nail plates were each fitted with 4-10mm cross dowels (the type used in many flat-pack furniture kits) and were locked into position with M6 flat-headed screws. However, later in the development process, I found it an advantage to add an extra platform plate at the feed-in end to ensure the fleece was fully picked-up by the slide unit. The platform plate is fitted with 4-screws which allow the upper surface to be adjusted close to the tips of the nails in the slide unit and is connected by a hinge to the inlet ramp plate, which allows it to follow the setting height of the lower nail plates. You will notice from the exploded diagram that the nails in the 2-nail plates are pointing in different directions. This is something that has to be played about with and decided by the user, as some fleeces can be picked quite satifactorally with all the nails on one direction, whilst others may need opposing sets. (I have also tried having opposite directions of nails on each half of one nail plate with quite good results). When I started to design this Nail Picker I tried to get information on the spacings, angles and lengths for the nails that would be guaranteed to give the best results. However, every article I found on the internet seemed to offer entirely different advice to every other one, leaving me a bit confused. What I settled on, as regards the pitches of the nails is shown in the diagram - a longitudinal pitch of 15mm (with alternately staggered rows of 3- and 4-nails) and a lateral pitch of 25mm). Note: The lower plate shown has 8-nail rows, whilst the upper plate has 9-nail rows. This is, obviously, to allow one set of nails to pass through the gaps between the other nail set. As for the best angle to mount the nails in each plate, the advice given varied from almost vertical to 45°. I thought that drilling holes in the plates at 45° would be quite difficult, so I decided to try 30°. Even at this shallower angle, some care was needed to achieve an accurate result, so I considered it worthwhile to make up a simple jig (shown right) that would allow me to hold each plate at the correct angle on the pillar drill baseplate. I also found it easier if I had already centre punched and lightly counterdrilled each hole position before using the drill jig, as that gave me a good location to start the drilling as well as creating space for the head of the nails to seat in. Using 50mm long nails, at the chosen mounting angle, allowed me to achieve a safe maximum overlap of 22.5mm, as shown in the following adjustment range diagrams.